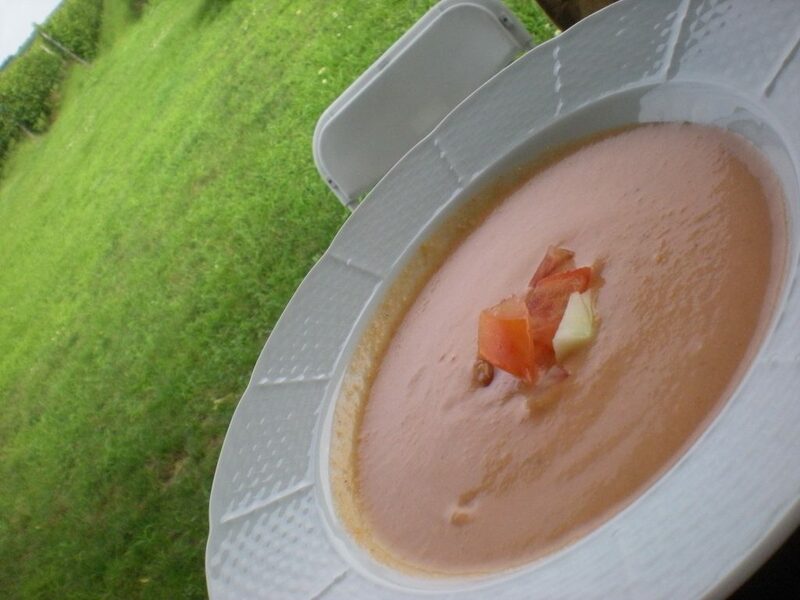 Soup on a summer day isn’t ideal, but gazpacho isn’t your everyday kind of soup. There are a million ways you can prepare this, but the beauty of the dish is in its simplicity. In July, we had an amazing group of women out for a personal Wine Trail Ride. The ride was great and at the end of the day we sat down to a wonderful meal. Every Wine Trail Ride meal is different and relies on what is in season and available. The meals are made with as many local ingredients as possible. It is a wonderful way of celebrating the abundance of agriculture that summer offers us. The gazpacho definitely sums up summer as it’s a light refreshing chilled soup that uses fresh ingredients and no cooking required! Puree the tomatoes, cucumber, onion, garlic, almonds, water, vinegar, oil and 2 tsp of salt in a blender until smooth. You want a nice velvety looking soup. Season with pepper. Refrigerate at least 45 minutes. You can drizzle with a little oil or I like to chop up some of the extra vegetables as a garnish. Season with salt and pepper to taste. It is a great summertime soup recipe and is very adaptable. So if you want more tomatoes, less almonds, etc go for it. Our next Wine Trail Ride is September 17 and tickets are still available. If you are interested in organizing your own Personal Wine Trail Ride, you can always email us. The rides are a wonderful way to get together with friends, family or organize a unique outing with a bridal party. Thanks to Gina, Amy, Nicole, Annette, and Becky for a great day!